With 29 homicides [not counting the criminal negligence cases that police don’t officially tally as such] so far this year in Winnipeg, we’re slowly getting to Edmonton levels with four months left to go in the year. And while culpable killings, naturally, are difficult to predict, one trend stands out. There’s 2 to 1 odds if someone’s going to kill you, it will happen on a Saturday. Of the killing events [not the total number of deaths in the case of multiple victims such as the 5 for 1 arson at the rooming house earlier this summer], seven took place on a Saturday. I can’t say if the Saturday likelihood of violent death speaks to any trend in particular [except for the fact past years follow suit, largely], Many of the deaths happen on a day where people are raring to relax after a long week, perhaps have funds to purchase booze or drugs, and get right ornery when they consume too much as the majority of the circumstances of the killings appear to suggest. I’m not sure if there’s some policies that could be altered to acknowledge this and perhaps bring some calm to the deadliest day of the year so far: Saturday, but it may be worth a look. Also, I’d like to point out that the bulk of the homicides are currently cleared by police in terms of their charging of the suspect. At my count, it stands at about 85-90 per cent — a high number and one to be proud of the WPS for. On the flip side, we’re seeing no reaction from either the city or the WPS regarding plans to combat the violence as was the recent case in Edmonton. Should Winnipeg hit 35 homicides this year, it would be a record number — the highest since 2004. Chief Keith McCaskill said months ago violent-crime reduction targets for the city would be announced as part of a strategic plan the service has been working on — and said recently there have been (unspecified) delays in that plan — but as yet, there’s been no official public announcement about reduction targets. However, to be fair, police can’t predict homicides by and large, so maybe those targets will have no impact on same. 1] Jan 6 (Thursday): Darryl John SINCLAIR, 45, stabbed. Robert Carl PRINCE, 44 charged with 2nd-degree murder. 2] Jan 16 (Sunday): Zenon Sylvester BOZYNSKI, 48 injured, perhaps beaten outside a Redwood Avenue apartment block. Jamie Jossens MORRISSEAU, 27 years of Winnipeg and Gamielle William Harry COURCHENE, 25 years of Fort Alexander, Manitoba have both been charged with 2nd Degree Murder. 3] Jan 28 (Friday): A 16-year-old male stabbed on Allegheny Drive. 28-year-old Matthew Craig KRASNY of Winnipeg has been arrested and charged with 2nd Degree Murder as a result of his alleged involvement. 4 and 5] Feb 5 (Saturday): Darren Joey SWAMPY, 19 years of age and Lee Brady SPENCE, 22 shot on Elgin Avenue. Randy Murray WILLIAMS, 27 years of age was arrested and subsequently charged with 2nd Degree Murder x 2 as a result of his alleged involvement. 6] A 22-year-old man arrested in connection to a criminal negligence cause death case where a man was killed in a snowmobile crash on Jan. 13 (Thursday). 7] Feb 18 (Friday): Casandra Lydia KNOTT, 27 is arrested for the homicide of Orzias Joram KNOTT, 34. 8] Feb 24 (Undetermined): Senior citizen Elizabeth Lafantasie is found dead, stuffed in her trunk. A few days later Thomas Brine is arrested and charged with first-degree murder. 9] March 16 (Wednesday), Abdul Rahim Mah JEMEI 22 is stabbed to death downtown. A 16 year old male is arrested soon after, and Ramsey SWAIN, 24 is charged March 29. 10] March 28 (Monday): Frank Alexander dies after an alleged assault at Parkview Place. Joe McLeod, an alzheimer’s patient, is charged with manslaughter. 11]April 13 (Wednesday): Joanna Storm died crossing Henderson Highway. An 18-year-old man is charged with criminal negligence cause death. 12] April 20 (Wednesday), 42-year-old Sheila Fontaine is killed outside the Merchant’s Hotel on Selkirk. The arrest of Teya Wynter SPENCE, 18 is announced a few days later. She and three other teen girls face manslaughter charges. 13] April 29 (Friday): 20-year-old Trevor Harper is shot in the 500 block of Portage. 15 year old male youth was located and arrested in the area of Pembina Highway and Plaza Drive on May 4 . 14] May 10 (Tuesday): Solomon Joseph Andrew TURNER found dead — stabbed — in his home. The next day, Lloyd Alfred Lindsay is charged with second-degree murder. Wanda Lisa RAHMAN (Bruce), 32 is charged with the same crime May 27. 15] May 14 (Saturday): Gina Swanson, 33 is found dead in her Edderton Avenue home. Schuyler Vanwissen [sometimes van Wissen] Charged with first-degree murder after being arrested in Toronto Aug. 12. 16] IRIS HEALD (GALLANT) dies May 16 (Monday) after hitting her head after an attack in the West End. Cynthia Elaine Thomas, 35, is charged. 17] May 16 (Monday): Gerald Crayford, 54, dies after an apparent assault at a Pizza Hotline outlet. A 15-year-old is charged with second-degree murder. Byron Charlie Bushie, 18 is arrested and charged with the same crime a few days later. 18] May 21 (Saturday): Leslie Alex OKEMOW, 29 is found dead at the St. Regis. Arnold Harper turns himself in to face a manslaughter charge on May 21. 19] June 26 (Sunday): Steven Kyle DODGE, 26, found stabbed on Arlington. Same day: Nathan Allan BRICKLIN, 18 years of age is charged with second-degree murder. 20, 21, 22, 23 and 24] Lulonda Lynn Flett is charged with five counts of second degree murder for the July 16 (Saturday) arson-related deaths of Norman Darius ANDERSON, 22 years Maureen Claire HARPER, 54 years, Kenneth Bradley MONKMAN, 49 years, Dean James STRANDEN, 44 years, and Robert Curtis LAFORTE, 56 years. She also faces three attempted murder charges. 25] Cara Lynn HIEBERT, 31 is found dead in her home July 19 (Tuesday) and her death is considered a homicide. Case as-yet unsolved. Anyone who has information regarding this incident is asked to call investigators at 986-6508 or CrimeStoppers at 786- TIPS (8477). 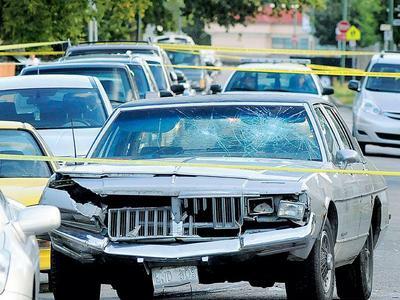 26] Aug. 5 (Friday), Baljinder Singh Sidhu killed after an incident in Osborne Village. Case still unsolved. Anyone who has information regarding this incident is asked to call investigators at 986-6508 or CrimeStoppers at 786- TIPS (8477). 27] Aug. 20. (Saturday) Marcel Murdock dies after being hit by a vehicle after a street brawl on Garfield Street North. A 17-year-old girl is initally charged with manslaughter, but charges are later upgraded to first-degree murder. 28] Aug. 21 (Sunday), Tim Koostachin dies after hitting his head after a fight. 19 year old Ray Vaughn MUNRO has been charged with Manslaughter due to his alleged involvement. 29] Aug. 27 (Saturday) Robert Rourke, 22, dies after a stabbing a week earlier after a party. Gregory Troy Govereau faces a second-degree murder charge. 30] Aug. 27 (Saturday) April Hornbrook, 24, is found dead on a dirt path near the Main Street train overpass. No arrests yet made.